The former powder magazine, or according to other sources, victualling store, of the Austro Hungarian and subsequently Polish barracks where Auschwitz concentration camp was set up in June 1940, was modified, starting about 5th July of that year, to be used as a crematorium installation for incinerating dead prisoners. The work was carried out by the first inmates (Polish political prisoners), who arrived on 14th June. This conversion, one of the first if not the very first, was planned and the drawings produced by the K.L. Auschwitz SS NEUBAULEITUNG / Construction Management. Only the list of the twelve initial drawings has been found, not the drawings themselves [Documents D1a, D1b and D2]. The only ornament on the building, a wrought iron lamp hanging over the main entrance [Photo 1], was also planned. The installation of a crematorium had been decided even before the first prisoners arrived. In the correspondence exchanged between J.A. TOPF & SONS of Erfurt, a firm with a section specialising in the manufacture and installation of crematorium furnaces [section D IV, Krematoriumbau, directed by the chief engineer by the Kurt Prüfer] and the SS Neubauleitung of K.L. 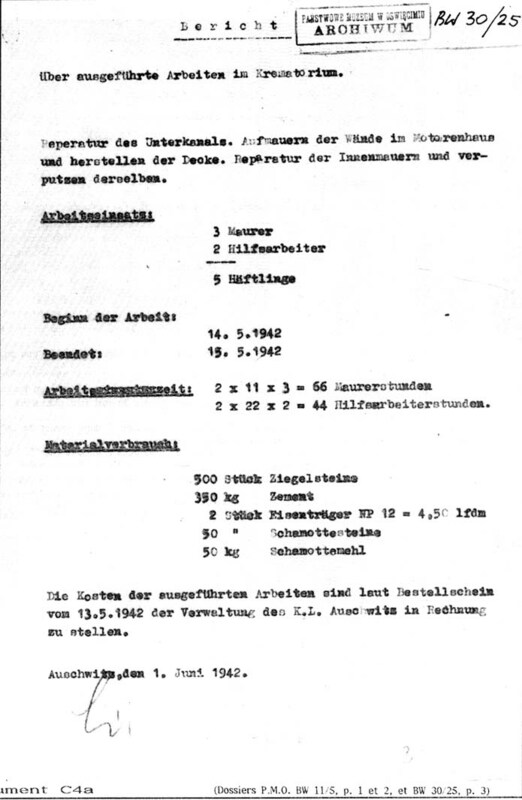 Mauthausen [Bundesarchiv Koblenz NS 4 Mauthausen/54], there is a letter of 23rd November 1940 mentioning that Topf had received an order for second two muffle furnace of exactly the same type as that proposed for the Mauthausen camp (and destined for the Gusen subcamp). The Topf drawing of this furnace attached to the letter, No. 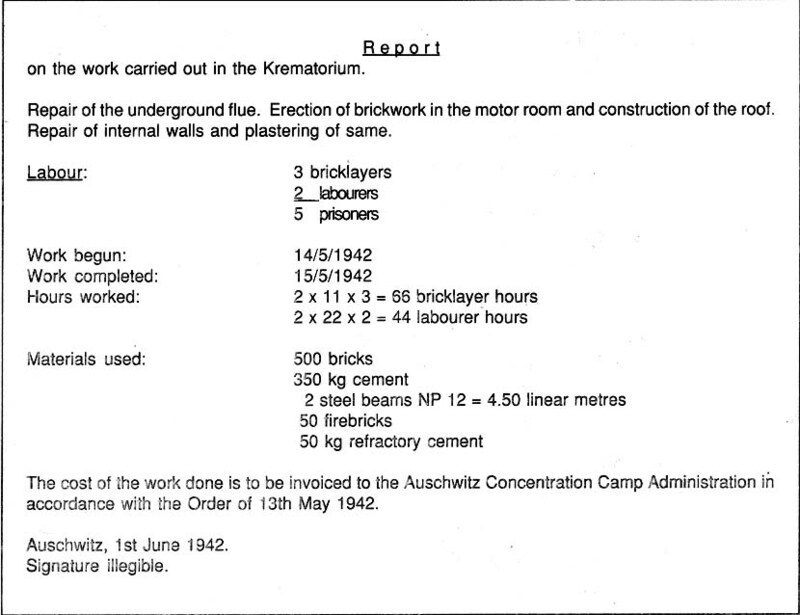 057253 of 6th June 1940 [Document E], actually refers to Auschwitz and shows the first furnace to be installed in Krematorium I. It gives details of the internal structure.